In a scenario where millions of years are considered a short period of time, hours are barely a blink of an eye. While it might take ten years or more to observe a group of galaxies with a modicum of detail for telescopes around the world, the Atcama Large Millimeter/submillimeter Array (ALMA) telescope was able to do the job at amazing speed. In just a matter of hours, a team of astronomers using this super-powerful telescope homed in on the location of over a hundred star-forming galaxies in the early Universe. Once upon a time, huge amounts of star birth occurred in early galaxies which were rich in cosmic dust. Studying these galaxies is imperative to our understanding of galactic formation and evolution – but it has proved difficult in visible light because the very dust which supports star formation also cloaks the galaxies in which they are formed. However, thanks to telescopes like ALMA, we’re able to identify and observe these galaxies by focusing on longer wavelengths. Light that comes in around one millimetre is the perfect playground for such study. Just how do we know where these galaxies are located? Through the use of the ESO-operated Atacama Pathfinder Experiment telescope (APEX), astronomers were able to map these dust obscured targets to a certain degree. APEX focused its capabilities on an area of sky about the size of the full Moon in the constellation of Fornax. The study – Chandra Deep Field South – has been taken on by a variety of telescopes located both here on Earth and in space. Here is where APEX has been credited with locating 126 dusty galaxies. However, these images aren’t all they could be. Star forming areas appeared as blobs and sometimes could over-ride better images made at other wavelengths. 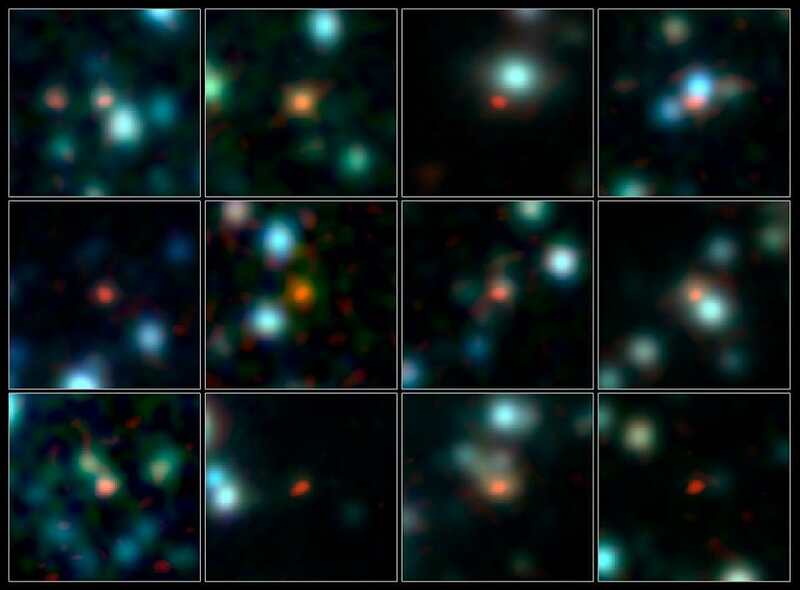 Through the use of ALMA, these observations have been augmented, furthering the resolution in the millimetre/submillimetre portion of the spectrum and assisting astronomers in knowing precisely which galaxies are forming stars. As all backyard astronomers know, the larger the aperture – the better the resolution. To improve their observations of the early Universe, astronomers needed a bigger telescope. APEX consists of a twelve meter diameter dish-shaped antenna, but ALMA consists of many dishes spread over long distances. The signals from all of its parts are then combined and the result is the same as if it were a giant telescope which measured the same size as the entire array. A super dish! With the assistance of ALMA, the astronomers then took on the galaxies from the APEX map. Even though the ALMA array is still under construction and using less than a quarter of its capabilities, the team was able to complete this beginning phase of scientific observations. Speedy ALMA was up to the task. At only two minutes per galaxy, this “Super Scope” was able to resolve each one within a minuscule area two hundred times smaller than the original APEX blobs… and with 300% more sensitivity! With a track record like that, ALMA was able to double the number of observations in a matter of hours. Now the researchers were able to clearly see which galaxies contained active star forming regions and distinguish cases where multiple star-forming galaxies had melded to appear as one in earlier studies. Apparently ALMA is going to be a huge success. These new observations have helped to confidently document dusty star-forming galaxies from the early Universe and help to create a more detailed catalog than ever before. These new findings will assist future astronomical observations by giving researchers a reliable base on these galaxies’ properties at different wavelengths. No longer will astronomers have to “guess” at which galaxies may have melded together in images… ALMA has made it clear. However, don’t rule out the use of other venues such as APEX. The combination of both play a powerful part in observing the early Universe. “APEX can cover a wide area of the sky faster than ALMA, and so it’s ideal for discovering these galaxies. Once we know where to look, we can use ALMA to locate them exactly,” concluded Ian Smail (Durham University, United Kingdom), co-author of the new paper. Original Story Source: ESO Science News Release. ALMA is so powerful that it has revolutionised the way that we can observe these galaxies, even though the telescope was not fully completed at the time of the observations. Seriously? * An ALMA survey of submillimetre galaxies in the Extended Chandra Deep Field South: High resolution 870um source counts. Alma is the best I have ever witnessed. Webb will be online next year. The disciplines in optics are so remarkable. In 50 to 100 years we’ll be able to see planets revolving around it star w/out seeings its dimming or reading its gas signature(s).. Now that’s a good trick. Where did you read that Webb will be online next year? As far as I know it will launch at the earliest in 2018. Future delays might move it past that date. Type O….2014 was supposed to be the sched launch date. Yes, delays pushed it to 2018. I was so disappointed. Sad how funding can be an obstacle, well as parts etc.. . Take care. Can’t wait to see how SKA will compare to ALMA. This one is already giving us great things to look for in the future and it’s not even fully operational.